Hardcover, 8 x 10 in. / 230 pgs / 100 color. Edited by Claire Tancons, Krista Thompson. Foreword by Neil Barclay, Renaud Proch. Text by D. Eric Bookhardt, Petrina Dacres, Paul Goodwin, Shannon Jackson, Erica Moiah James, Nicholas Laughlin, Thomas J. Lax, Alanna Lockward, Kobena Mercer, Annie Paul, Claire Tancons, Krista Thompson, Yolande-Salomé Toumson. EN MAS' is one of the first publications to give serious scholarly attention to contemporary art works considering carnival in the 21st century, filling a gap in two decades of exhibitions of contemporary Caribbean art that did not explicitly address carnival as an artistic practice. A hybrid exhibition catalogue and academic reader with a lively carnivalesque feel, it presents nine newly commissioned artist projects by John Beadle, Charles Campbell, Christophe Chassol, Nicolás Dumit Estévez, Marlon Griffith, Hew Locke, Ebony G. Patterson, Lorraine O'Grady and Cauleen Smith. 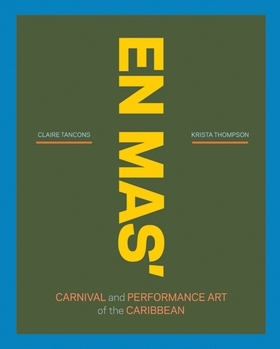 The book also includes a timeline of diasporic pan-Caribbean carnivals, tracing the influence of Caribbean carnivals and festivals on the theater, dance, and Broadway stages in New York and London, in contemporary art galleries and biennials from São Paulo to Havana to Gwangju, at the Olympics as well as in protest and other movements. 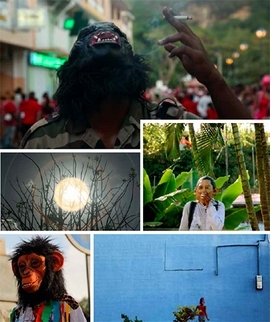 Featured image is reproduced from EN MAS’. FORMAT: Hbk, 8 x 10 in. / 230 pgs / 100 color. Published by Independent Curators International and Contemporary Art Center, New Orleans.